1. Boil or steam scrubbed potatoes for 8 mins, drain & cool. Peel off the skin then coarsely grate them into a large bowl, season with salt & pepper. 2. Coarsely grate courgettes, squeeze out as much water as possible by wringing them in a clean tea-towel. This is a Delia recipe, therefore reliable, tasty and simple. Great served with a fresh tomato sauce and crusty bread. 3. 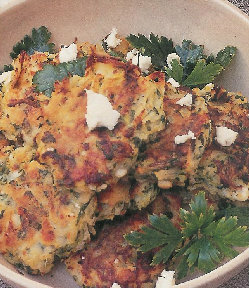 Add courgettes to potatoes, along with spring onions, mint, crumbled feta and beaten egg. Toss together to mix thoroughly. Divide the mixture into 12 little cakes, pressing them firmly together. Dust the cakes with the flour. 4. Pre-heat the oven to 220C, also pre-heat a baking sheet. Melt the butter and oil in a small saucepan and brush the cakes on both sides. Place the cakes on the hot baking sheet and bake for 15 minutes, turn them using a palette knife and a fork, then bake for another 15 minutes. Serve hot.